Sprouting Farms located in Talcott, WV is a production scale farm and farmer training program, supported in part by a grant from the Appalachian Regional Commission. High tunnels can be rented for $30 per month at Sprouting Farms in Talcott, WV. “Our goal is to not just make this site work, but the whole regional food system work, and we have lots of farmers and partners who are interested in making that happen,” says Sprouting Farms project Director Fritz Boettner. In 2017, Sprouting Farms received a $1.5 million grant from the Appalachian Regional Commission. The project was an inaugural recipient of ARC’s POWER initiative, which provides federal dollars to coal-impacted communities. The goal is to diversity and help grow these economies. 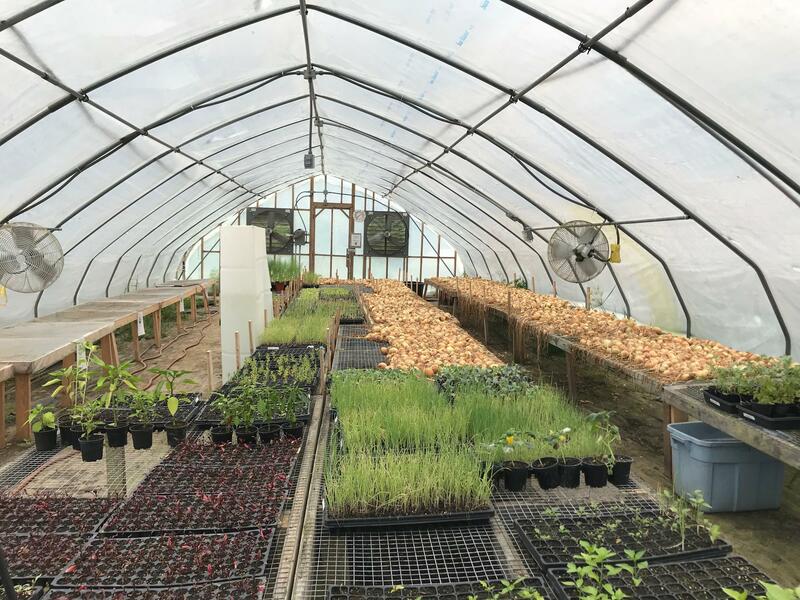 Sprouting Farms aims to boost the reach of small-scale agriculture in the eastern and southern parts of West Virginia by training new farmers and providing inexpensive land and tools for budding agriculturalists. During the project’s first year, the team quickly realized to make local food production a bustling economy of scale in a state with challenging topography and a spread-out population, they needed to boost access to markets -- everything from the more traditional farmer’s markets to the wholesale level, including getting more local food in restaurants and grocery stores. Tomatoes are just one of the many things grown at Sprouting Farms. 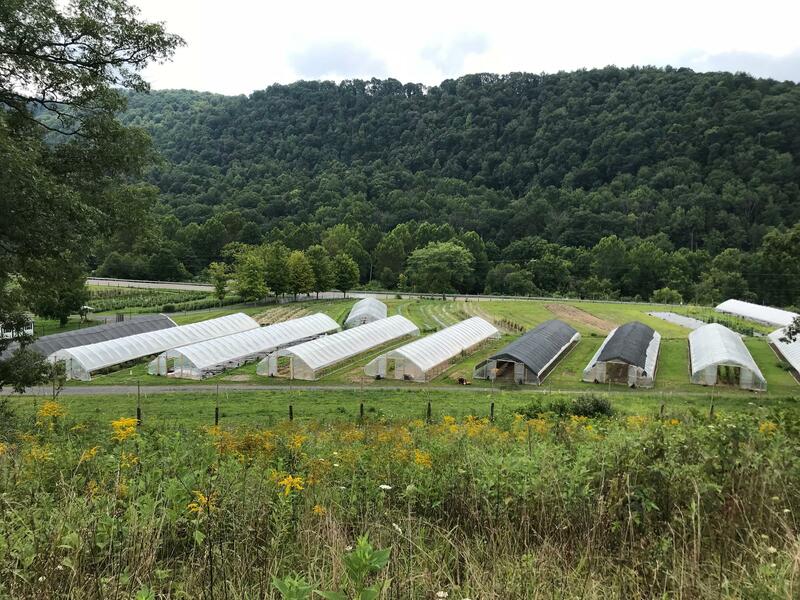 On a recent tour of the 83-acre farm, Boettner explains how Sprouting Farms is trying to break down barriers -- physical, financial and market-based -- so farmers can be successful in West Virginia. Outside of the farm’s faded red barn, a row of white plastic covered greenhouses, or high tunnels, are clearly visible. Black plastic tarp is also used on some parts of the farm. The seed starting greenhouse is one tool available to renters at Sprouting Farms. Some of the 30 greenhouses are used by Sprouting Farms itself, but others are rented by local farmers who may not have the space or ability to invest thousands of dollars into the equipment needed to farm in this way. One high tunnel immediately sticks out. An abundance of bright pink and yellow flowers seem to dance inside. Sunflowers peak out merrily from the back. This monthly renter is one of the farm’s first. Now in her second year, renting offers the opportunity to grow a business without making costly upfront investments, Boettner says. One renter at Sprouting Farms uses her high tunnel to run a cut flower business. Renters pay $30 per month for a 30-by-100-foot high tunnel. That includes electricity and water. For a few dollars more, they can use the farm’s tools, including the tractor. But what if you want to be a farmer, but don’t know how? Beckley resident Ruby Daniels came to Sprouting Farms in March to participate in the project’s apprenticeship program. Daniels’ family history is steeped in farming. Her great-grandfather was a slave who came to West Virginia to cut coal out of the seams before that job was done by machines. After he was injured, the family ran an orchard and a restaurant in the area. Daniels has a master’s degree in therapeutic herbalism, and owning her own farm has long been a dream, but she says she lacked some of the production planning expertise. Daniels grows herbs, beans and other things in the high tunnel she shares. Daniels makes herbal teas and tinctures with the herbs she grows and says Sprouting Farms has given her the tools she needs to expand. Sprouting Farms’ decision to both be a fully operational production farm and offer education program is intentional. Boettner says by running their own farm, the team can workshop the best ways to grow on a larger scale in West Virginia, which doesn’t have big swaths of flat land like the Midwest or California. The farmers who rent or train here also benefit from having the staff and tools on site, he adds. Boettner is a West Virginia native and no stranger to farming. He grew up in Charleston, but spent a lot of time at his grandparent’s farm in Virginia. He says he always knew he wanted to be a farmer. Sprouting Farms Director Fritz Boettner poses. After spending some time in Colorado, Boettner did move back. He co-founded a consulting firm called Downstream Strategies. Clients began hiring him to look into different economic development opportunities for West Virginia. One that came up a lot was agriculture. At some point he and his business partner decided to take the thought experiments to the fields. Using a grant from the U.S. Department of Agriculture, they crafted a business plan. Then, they heard about the ARC grant. Marshall University's Robert C Byrd Institute partnered with the project for the ARC grant. While it has helped launch Sprouting Farms, Boettner says there’s still a big obstacle before agriculture is a viable economy here. “We know that here the markets are a challenge,” he says. West Virginia leads the nation in small farms. Of the more than 20,000 farms here, 97 percent of them are considered small and 93 percent are family-owned, according to the USDA. Most vegetable farmers in the state gross ring less than $50,000 a year, and once expenses are accounted for, it’s hardly a good living. Selling more produce, or higher-value produce, to restaurants or grocery stores, could help. That’s why Sprouting Farms started a food hub, Greenbrier Valley Grown. Food hubs are a centralized location where farmers can bring their food for processing and to go to market. They become the middleman. Farmers tell the hub what they have to sell. The hub aggregates it and delivers it to buyers. A restaurant might be getting squash from four different farms, but it’s delivered by just one entity: The hub. The refrigerated truck owned by the Greenbrier Valley Grown food hub is used to transport food from the eastern part of the state to customers in Charleston, including at the Capitol Market. Todd Schmidt, an associate professor at Cornell University who studies agribusiness development in rural communities, says food hubs are growing in popularity across the country as more restaurants, grocery stores and other institutions seek more local food, because increasingly their customers ask for it. “The market access issue, particularly in thinking about collaborative marketing operations, cooperatives, food hubs is something that is, that is providing beneficial to small-scale producers,” he says. Having access to a food hub has benefited Roger Dolan, who owns The Wild Bean in downtown Lewisburg. The hip coffee shop also serves vegetarian fare and does a rocking trade in smoothies. Dolan says he has always tried to source as much of the produce The Wild Bean uses locally, but says it was hard juggling communications with multiple farms to get what he needed. Then he found a food hub and, despite an occasional produce shortage, he says it’s a boon to business to be able to advertise the restaurant uses locally-sourced produce. This fall, the two largest food hubs in the southern and eastern portions of West Virginia are converging. Sprouting Farms’ Greenbrier Valley Grown and ReFresh Appalachia’s food hub are joining with other large producers and growers’ groups under the umbrella organization, the Turnrow Appalachian Farm Collective. The West Virginia Department of Agriculture estimates West Virginians consume $8 billion of food annually but the state only produces $800 million. If the new combined food hub can boost the amount of locally produced food bought by West Virginians by just a few percentage points, it could have big returns, says Jim Matson, an agricultural economist based in South Carolina. Sprouting Farms in Talcott, WV. Back at the farm, Boettner and I climb to the top of a hill to get the birds-eye view of Sprouting Farms. As we look out over the land, dotted with white covered high tunnels, he reflects on the work they’ve accomplished so far. “I’m happy with the progress we’ve made, absolutely, but I also know there’s an extremely long way to go,” he says laughing. Boettner says as the project goes into its second year, it does so with more data and feedback on what has worked so far, and what hasn’t. One thing he doesn’t question is the appetite for more local food. Sprouting Farms has two more years of federal funding from the ARC for the first phrase of the project. They’re hoping that in the meantime, they can find a way to be more self-sustaining, bringing a profit to their organization, to continue after the grant runs out.